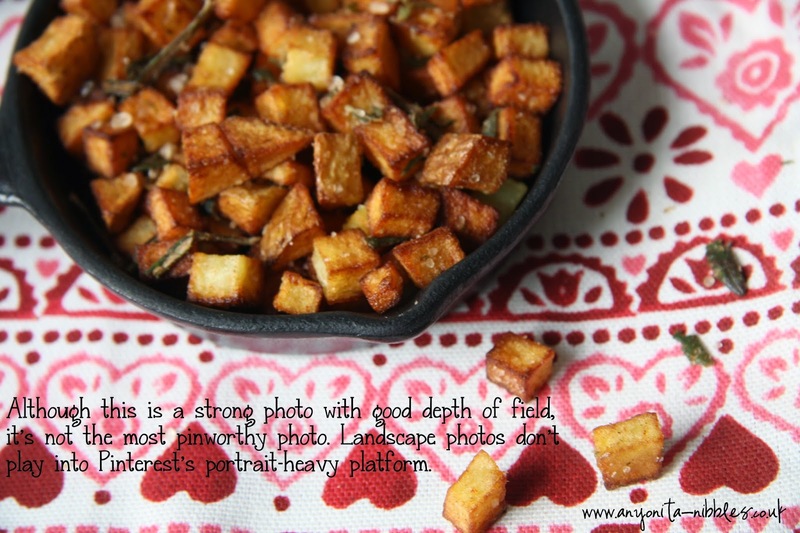 Ensure that your photos are pinnable. Having a pinnable photo is of utmost importance because Pinterest is a visual platform that is photo heavy. One thing to remember about Pinterest is that, on the whole, it is meant to be an inspiring place where people collect ideas of projects they want to do, trips they want to take and food they want to eat. Your photos need to play into that as much as possible. * Of course, there will always be exceptions. When the behind-the-scenes photos have been staged artistically, they can perform just as well as the finished products photos, especially when incorporated into a tutorial or instructional post. Here's a general rule of thumb: a photo of a steaming plate of spaghetti with mouthwatering bolognese sauce is going to be more pinworthy than the ingredients used to make the spaghetti arranged uncooked in their boxes. **Portrait photos work better because Pinterest is designed in such a way to favor them. Think about the natural columns you'll see in your Pinterest feed: they're thin and long and photos that slot into these columns are more appealing than boxy square photos. You barely notice the landscape photo because it is so much smaller and less enticing than all the other portrait photos around it. With the portrait photo, you eye is drawn to it quickly and it is more engaging because you can clearly see the photo and what's in it. Be sure to use alt tags. Clicking those links will take you to two tutorials written by me about the importance of alt tags on Pinterest. Be certain to leave succinct descriptions. Even if your photo is stunningly beautiful and is a portrait shot and is bright and engaging, if it's not clear what your photo is meant to convey, your content will fall short. Another way to be sure your description is hitting all the right notes and is working for your benefit is to use hashtags. Don't, I repeat, do not go over the top with the hastags. Hashtags should be used sparingly and within reason and to help to corral interested pinners and make them aware of your content. Let's say, I was pinning my portrait photo and wanted to use what I know about the importance of alt text to set my pin description. Which do you think is more important for the pin? Which do you think most closely relates to searches people are likely doing on Pinterest at the moment? I'm not sure how many people would be searching for "#linen with #hearts" but you can be certain that thousands are searching for "#glutenfree", "#vegetarian" and "#vegan". While there's nothing wrong with the #greatdinneridea and #easymeals tags, that's the type of information that you could convey by pinning this photo to a board entitled Dinner Ideas or Easy Meals. When you use hashtags, especially on Pinterest, treat them like keywords: use ones that you have a chance of benefiting from. Every food blogger who shares dinners on Pinterest would claim that their recipe was a #greatdinneridea. The competition to gain traffic from that overly used hashtag would be fierce. So, instead, I opt for more niche, yet still relevant hashtags. Here's the key to keeping a level head with Pinterest hashtags: use them to tell valuable, relevant information the viewer might have missed otherwise. 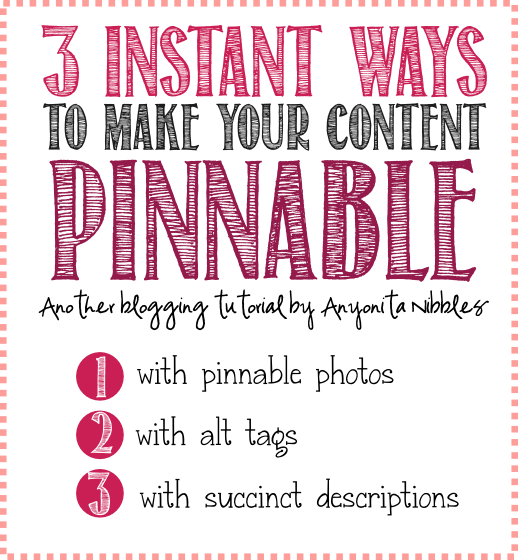 What tips do you have for pinnable content? These are some great tips. I obviously need to work on my pinterest skills! What a helpful post! Will be sure to put these points into practice. Very helpful post on Pinterest. While I've read about the importance of a using portrait pictures versus landscape, I've never seen in displayed so cleverly and succinctly before. Thank you! Aww what a lovely comment, Meghan! :) Thank you! Your blog tips are always helpful! Pinned and tweeted! 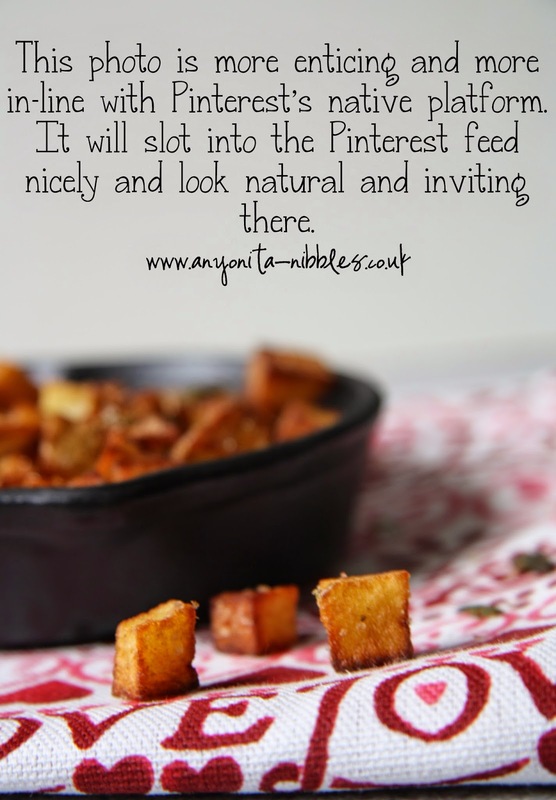 Anyonita, Is the proper way to have a business pinterest page, to go to your own blog, "pin" your pictures to your OWN pinterest page? I did it, and it worked...but something doesn't seem right about that! haha. You definitely want to pin that way. There's nothing wrong about it, all you're doing is sharing your great blog content on another platform. When you publish a post, do you share it on Facebook? Tweet about it? Pinterest is the same. I have a board dedicated to my blog and I pin to it every time I post. The way I balance it, is to make sure I don't have multiple boards filled with my own content; it's a very small percentage of what I pin each day.